In the new v5, glossaries have a new file format and a new file extension (was ipglo in v4 and now it's peglo in v5). When converting a database that contains shared glossaries from v4 to v5, all shared glossaries will display a warning icon. This happens because the associated linked glossary file is missing (since the glossary file extension has changed). 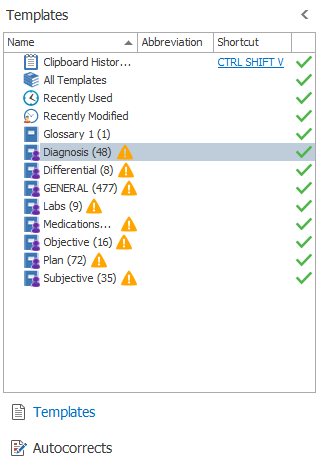 When upgrading the database on other machines, you should then see the green checkmark near each glossary as the linked glossary file has already been converted.